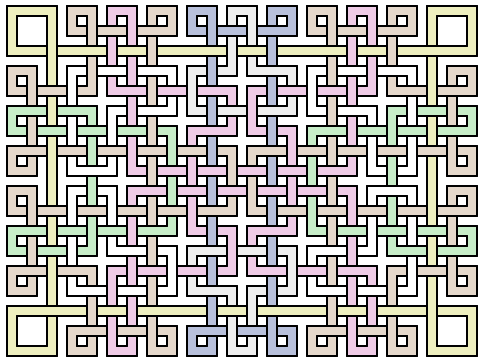 I like this lattice because it nearly fills a square, consists entirely of loops, is symmetric, and has a pleasing denseness in the center without being simply a hatch-work. I recently re-drew it from memory for my son, which got me thinking about the original drawings I did of them. I went and found some of them. The image above was created on a computer, but 25 years ago I didn’t have that option. So I settled for paper and pencil, but not just any would do: I used 1-mm graph paper and a mechanical pencil. With those simple tools, I made some pretty intricate drawings. I would get into almost a trance-like state creating some of them. My lattice technique was to start with a hatch-work lattice of a certain size, and then poke holes in it to change the shape of the pieces. The esthetics of the exercise were to get the holes so that the weave was dense, but not repetitive. I was always fascinated to see how moving a hole would drastically alter the shapes of the component loops. Certainly, you couldn’t design these things by starting with the loop shapes. How could you get them packed in properly? And working from the holes “magically” made loops that fit together perfectly. 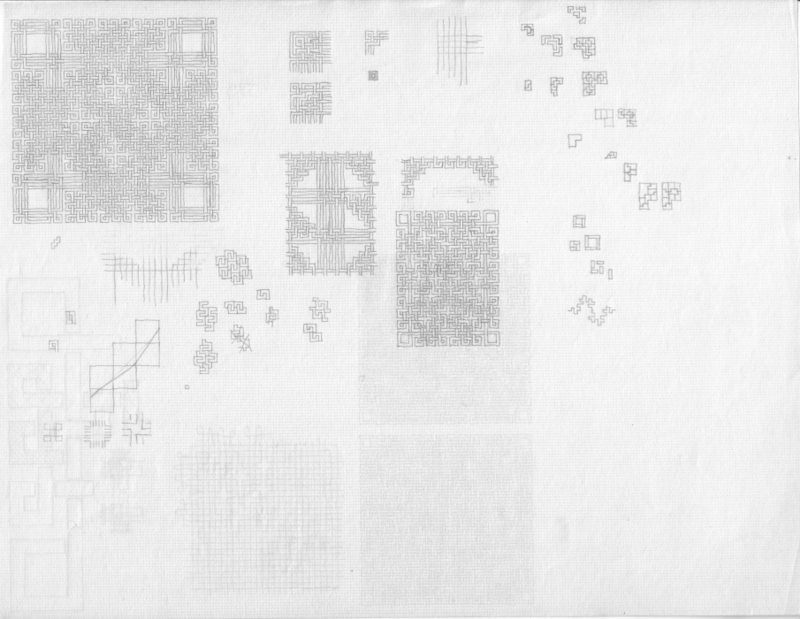 Platitude, my program for producing these drawings. My blog, where similar topics make appearances now and then. The original artwork was drawn on 1mm graph paper with a mechanical pencil, then scanned at 1200 dpi and scaled and filtered with the Gimp. The computer-drawn figures here were created with a Python program using aggdraw and Python Imaging Library, then colored with the Gimp. Cool stuff. 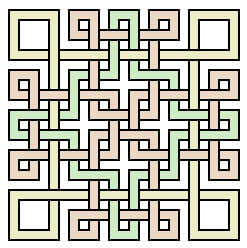 Once when I was down with fever I spent all my time doing celtic knots on paper. Fascinating! 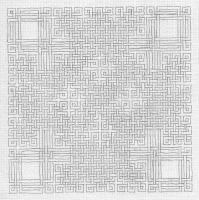 I used to use graph paper to draw mazes when I was young. 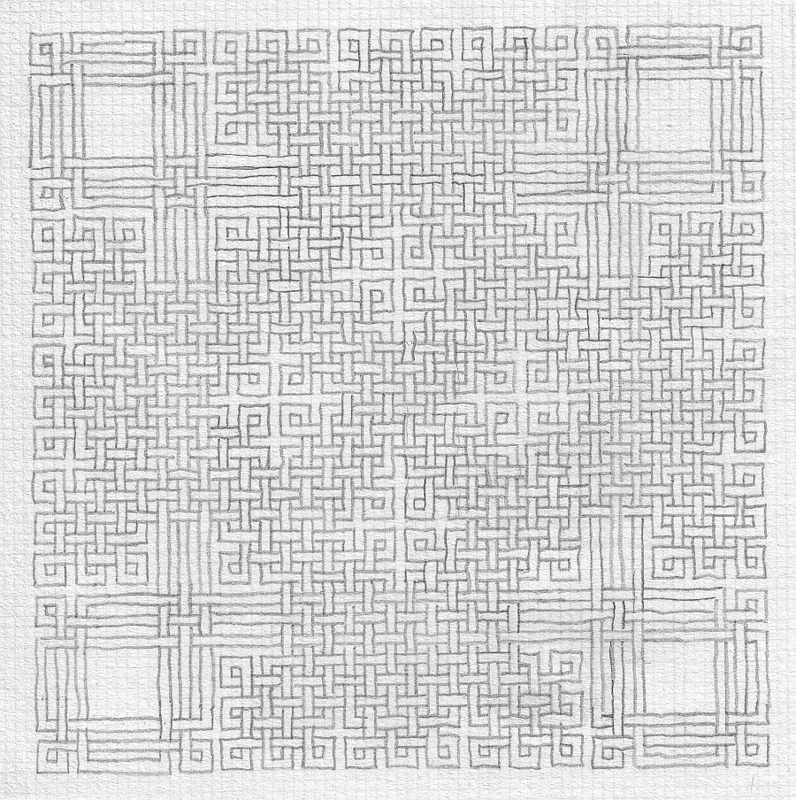 I now use grids as a device to produce intricate color drawings: random, center oriented (mandalas) and/or figure and shape specific. Good fun! 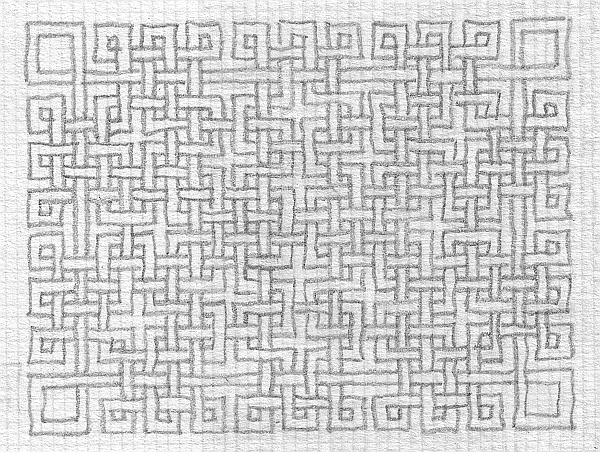 Funny, I recently re-discovered my own lattice work made lot of years ago using exactly the same technique: ball pen on millimetric graph paper. I have scanned them but not yet put them on the Net. 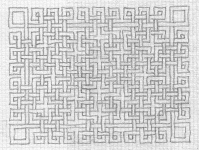 i drew mazes (and other stuff) as a preteen. no grid. It reminds me of celtic knots. I used to draw a lots till recent. Loved this site! Awesome work! !